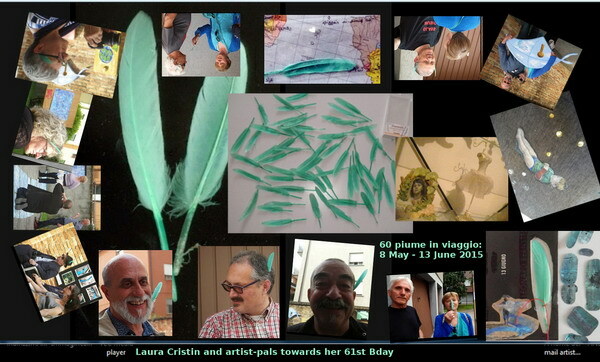 On May 8th, 60 feathers – received as a gift at Easter – were suddenly connected with the years of my life. Next I stamped all of them with my name and a performance took off/started in spite of any rational decision. In the following day, plumes travelled to the “Way Pavilion International” of Venice Biennale at Garage n. 3 where most of them were given out to artist-pals. The remaining feathers – set in proper cards, in transparent wrappings or whatever – will continue their voyage by snail mail or will be delivered on purpose, as long as my next Bday, on June 13th.